Philip Brandon Peirce is the son of Joseph Caldwell Peirce and Charlotte Hoggatt Brandon. 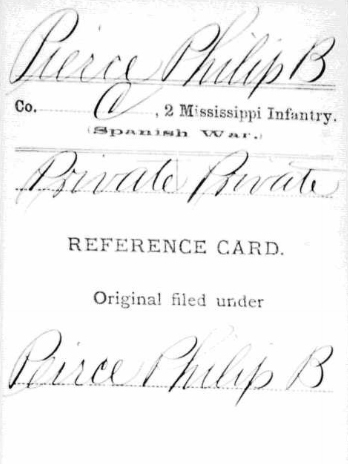 I found a record in the U.S., Spanish American War Volunteers, 1898 database that a Philip B. Peirce volunteered in 1898 and became a Private with the 2 Mississippi Infantry, Company C.
If this is our Philip, as I surmise (the dates would be correct), it seems the surname is Peirce rather than Pierce. I have seen it both ways while studying this branch of the family, but most often and on some significant documents it is Peirce. In the U.S., Civil War Pension Index: General Index to Pension Files, 1861-1934, there is a filing on Jul 11, 1927 as an "Invalid" for a Peirce, Philip B. in service of C2 Mississippi Infantry. The 1910 Census shows him living with his widowed father and single brother, Joseph, Jr. (who worked as a bartender), in Concordia, Louisiana. Their surname was listed as Prince/Pricer/Peirce but all other names and dates fit perfectly. 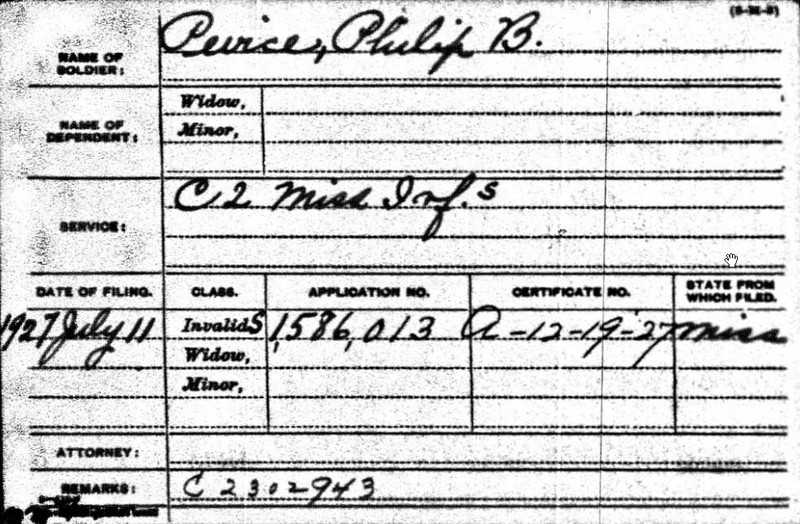 The last record I could find on Philip was the 1930 Census, showing him aged 57 and single. He lived alone in Natchez, Mississippi.